The Akra is only a low one and you need the linking piece for it - thats what makes it expensive. Just a little louder than the factory muffler with 'dB-Killer' installed. The Arrow is nice. Did you try without DB killer? Thanks. Yep, it was a tad too loud for me w/o the insert. I am selling my Roadsitalia. Shipping to America would be a bit expensive I think but maybe someone in Germany/Europe could be interested. Price would be 170Euro without shipping. He Manni, I might be interrested in the exhaust. Why are you getting rid of it? And which one of the 5 exhausts is it? Last edited by Momfer; September 23rd, 2014 at 06:38 AM. Its the Thunder exhaust - without kat and the silencer is edited so its a bit deeper. I sell it because I want to try something else next year - maybe a high-up with only 1 case or something. 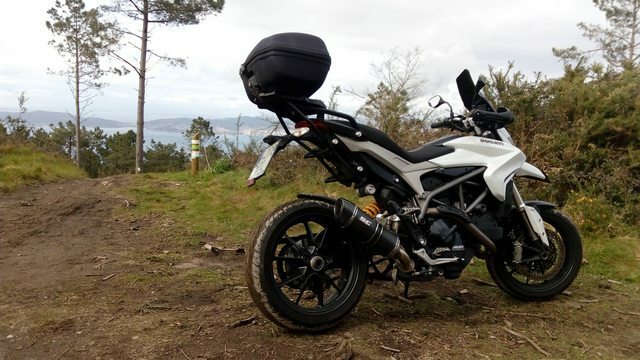 its nice, could you please or anybody tell me will the akrapovic low mount pipe work with hyperstrada saddle bags? So I just installed the Remus low pipe on the Hyper, absolutely love the sound! However, has anyone noticed with slip-ons, that the idle rev which is usually 1-1.5k RPM surges just a bit, stays under 2k but I can hear it just on and off going up then back down subtle. I didn't think I'd need a re-flash for just a slip on, I left the butterfly valve intact. Also the DB killer is out. Last edited by SkudShark; April 4th, 2016 at 11:54 AM. Now "surges" less in low RPM than the stock exhaust.